Product Description: A suitably pigmented, high quality, 100% acrylic latex. Contains a fungicidal agent to inhibit mildew growth on the surface of the coating. Intended Uses: A fast drying eggshell finish with excellent adhesion to new surfaces and to previously painted latex and alkyd finishes. Specially formulated for kitchens, laundry rooms and bathrooms where moisture and condensation occur. 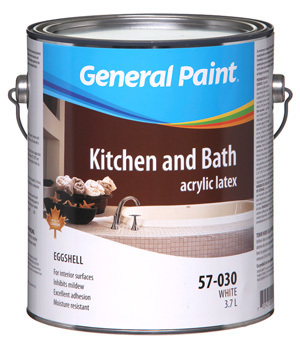 May also be used in other areas where a very durable eggshell finish is required. Extra Features: Contains a fungicidal agent to inhibit mildew growth.